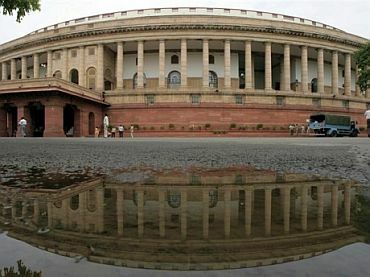 The much-delayed insurance bill and the goods and services tax bill are among the 39 bills that are expected to come up during the month-long Winter Session of Parliament beginning next week. Ministers of State for Parliamentary Affairs Mukhtar Abbas Naqvi and Rajiv Pratap Rudy were also present at the meeting held by the Finance Minister as Parliamentary Affairs Minister M Venkaiah Naidu is abroad on an official tour. Official sources said that the government is naturally keen on the consideration and passage of the insurance bill and the goods and services tax bill. The report of Parliament's Standing Committee on the insurance bill is expected by the end of the month. The delay has been due to the fact that two members of the Committee have now become Ministers. Two bills to replace ordinances -- Coal Mines Special Provision Ordinance and Textile Undertakings (Nationalisation) Laws (Amendment and Validation) Ordinance 2014 are on the priority agenda of the government. The coal ordinance allows companies that had their coal block allocations for captive use cancelled recently by the Supreme Court to bid for the mines, barring entities convicted of offences related to the allotment. The textile undertakings ordinance was to shield the National Textile Corporation from rent control laws that have been used to evict its sick textile units from prime land in several cities. In the session, the government is moving to amend Lokpal Act and the law governing the functioning of CBI to ensure that there is no requirement of "quorum" in the respective selection panels for choosing the anti-corruption ombudsman or the CBI chief.